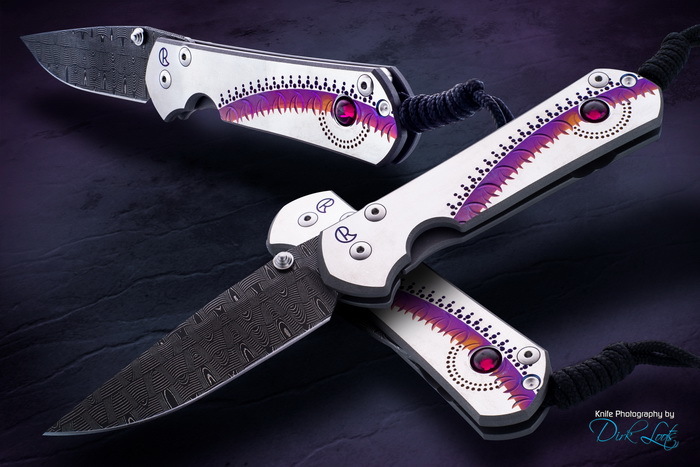 This a one-of-a-kind Sebenza 21 is embellished with one of Lisa L'Eveque-Hague's unique graphic designs and a premium faux ruby cabochon. The blade is of stainless Ladder Pattern Damascus by Devin Thomas. Comes with a black lanyard and spacer bead and slip pouch. The folding knife that has become the yardstick against which others are compared, the Sebenza has earned a worldwide reputation for rock solid performance and a "bank vault" feel. Chris developed the first Sebenza in 1987 and the profile has experienced minor changes over the years. After the entirely handmade version came the Original profile in 1990, the Regular in 1996 and the Classic in 2000. 2008 was the 21st year of the Sebenza and to celebrate the Sebenza 21 is an updated version of the classic that is easier to insert into a pocket or pouch.